Review: Have you ever thought that you could solve a kidnapping mystery? Well, Nancy Drew sure has! False Notes by Carolyn Keene has ideas and clues to ponder about kidnapping. It is the 3rd book in the All New Nancy Drew Series. 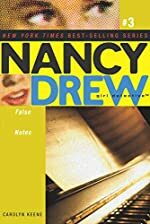 Nancy Drew, along with her two best friends, George Fayne and Bess Marvin by her side are determined to crack this kidnapping case, no matter how long it takes! When Nancy goes to her neighborhood friend, Lucia Gonsalvo, she suspects something very suspicious, with a bickering couple walking on the road. Later in the story, when they’re observing a newspaper, they find out that the couple fighting is the candidate for mayor, Mrs. Simmons and her husband. Nancy knew them because of their famous piano playing daughter, Leslie Simmons. After a while, Nancy and her friends start to figure out some mysterious clues about the argument her parents had had. Drawing conclusions too fast, she believes that someone is trying to distract Mr. and Mrs. Simmons from turning in their registration form for the mayor on time. The only possible culprit they have in mind is the other candidate for mayor, Granger. But after having a long discussion with him, he seems to know nothing about the situation. But then when they hear some news about a scholarship that the music agency is giving out, they knew that it isn’t Mr. and Mrs. Simmons who are the problem, its Leslie herself! Somebody very sneaky wants to win that scholarship more than Leslie, and would try to capture her so she doesn’t get to her audition on time. In the little town of River Heights, who would have the mind to do such a thing? You’ll just have to read and find out! False Notes is a wonderful mystery book, although I’d recommend this story to younger, high level readers, maybe around third grade. They’d enjoy the clues and suspicious action that takes place in this story. Being an eleven year old in sixth grade, I could predict what would happen next very easily. I did enjoy it though. In the book, my favorite part was the suspense. After almost every chapter, there was a distinctive cliffhanger that Carolyn Keene wrote. Although I did love it, there were a couple of negatives I had towards this book. After reading many Nancy Drew books, I’ve come to see that all of the books have the same outline. I was hoping for this book to really pop out to me. Also, the clues were very noticeable, and mostly happened towards the beginning of the story. The author, in my opinion should have spread out her clues better, and maybe added a few more. Nonetheless, people that enjoy books with suspense and many forks in the road will really truly enjoy this story. Review written by Priya, Grade 6. Date of review: October 2008.